Last week I had the joy and honor of interviewing three Nisei women who were talented, strong, and committed individuals. For three days we set up a temporary video studio at the Torrance Holiday Inn to interview eight women. I conducted the following three interviews. 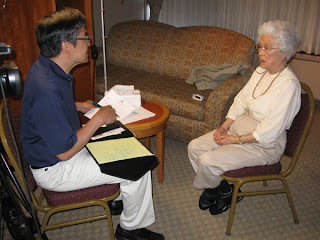 Aiko Yoshinaga-Herzig is known for her important research in support of the coram nobis cases and the redress effort. Our time together focused on her life before she became a researcher when she was a single mother raising three children and becoming more politically aware in New York City with the group, Asian Americans in Action. It was in her fifties when she launched her new career as an archival researcher. Wakako Yamauchi is a playwright who wrote “And the Soul Shall Dance” a play that I saw when I was in college in the late 1970s. Although it was 30 years ago when I saw the play, I still remember how well it captured the hardships and despair of Issei farmers. During Wakako’s interview we talked about her growing up in a farming family in the Imperial Valley and the hardships her family faced. We also talked about how she emerged as an artist and writer. 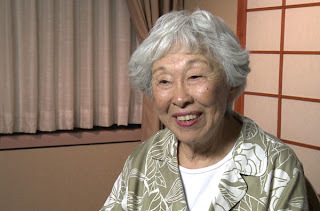 Mary Kageyama Nomura is nicknamed “The Songbird of Manzanar.” During Mary’s interview she talked about how she performed as a child at community events. She also described the difficulties when both her parents were dead when she was only eight years old and how her older brother kept the five siblings together as a family. Mary also talks about singing in Manzanar and the special relationship she had with Louis Frisell, the music teacher.